GPRS was contacted by a local construction company to scan for suspect radiant heat tubing at a new Tesla facility near Chicago, Illinois. The contractor needed to find the heat tubing in order to safely remove the metal sheath around the existing vehicle lifts future building projects. 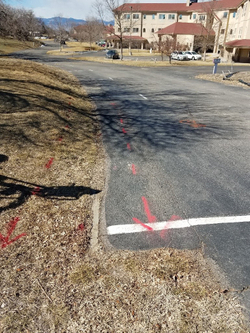 GPRS also scanned several areas for the electricians on site in order for them to safely dig a trench for new underground electric lines for the Tesla charging stations. GPRS was able to pair thermal imaging and GPR technologies in order to locate the heat tubing for a safer dig and saw cutting. The thermal camera we use can detect changes in temperature as small as <0.1°C with accuracy with 2°C. When the system is heated near to or after the start of the project there is a contrast between the temperature of the tubing and the concrete slab. It’s no mystery that drilling for environmental samples comes with certain risks. Overhead power lines, above ground obstacles like crowded parking lots, and, perhaps most challenging of all, underground utilities. Drillers, geotechs, and environmental firms alike know this particular challenge full well. Because of this, robust damage prevention plans are created in attempt to eliminate line strikes and other hazards associated with drilling for samples. Various best practices are considered, implemented, and refined as experience dictates. Ground Penetrating Radar Systems, LLC. (GPRS) was contracted to locate everything in a concrete slab at a parking garage, located in West Palm Beach, Florida. The contractor had no idea what was in this slab where they wanted to core due to the fact that the post tension plans are not 100% accurate. GPRS was hired to mark all findings in order for them to core drill so the local electricians could run electrical lines through the slab. With the amount of structural steel and post tension within a slab it is not easy to find a good place to core through a slab without compromising the strength of the structure. Reference the picture below. 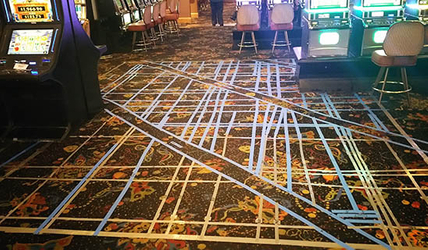 A valued customer recently requested that we map out all post tension cables in an Orlando area resort. There were four areas, each about 500-1000 square feet, that needed to be mapped out, with both the post tension cables and the conduit marked. We were asked to paint the PT cables red and the conduit blue in order to distinguish between the two. The customer had photos of the area prior to the concrete pour, so we were able to compare our field markings to photograph, and we thought the results were worth sharing. Not every job allows for such a stark visual confirmation of our findings, but in this case, the customer’s photo demonstrated the clarity and accuracy of our marks. Note: There was a piece of conduit in the photograph that was not in our field markings. We confirmed that this conduit had, in fact, been removed prior to the pour. It can be hard to foresee all situations and plan accordingly for each scenario when constructing new buildings. 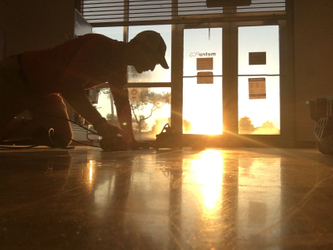 Subcontractors come and go and you can’t always keep an eye on what every person does on a job site. A plumbing contractor had installed the necessary plumbing lines and also installed clean-outs for future lines to be installed at a new warehouse in Orlando, FL. Little to their knowledge that after they installed everything the concrete team cover the clean-outs and poured concrete over them. The problem was that there was no way of them knowing where the clean-outs would be for future use. They had a good idea of where they were but finding multiple clean-outs in a large warehouse can be like finding a needle in a haystack. 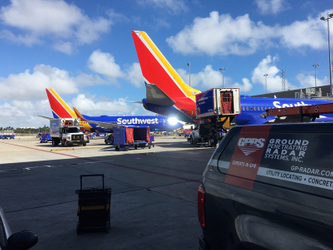 The Fort Lauderdale Airport has been making countless changes in recent years, as a result they’ve had Ground Penetrating Radar out there sporadically working alongside them in different projects. Recently, they were tasked with adding multiple steel plates to several beams. Normally, this would not be such a complicated job because the beams would not be filled with too many rebars that could hinder them from finding their coring locations. However, things were very different this time around and a bit problematic because, each time they drilled, they’d hit multiple rebars. GPRS was called out to scan for private utilities at a wastewater treatment plant near the quad cities in Iowa. The engineers on this project were not only concerned with where each utility was but also interested in mapping the features and including depths of each utilities. GPRS was able to come out with only a day notice and do just that! Scan before you plan! This ensures worker safety and saves valuable time by targeting specific areas of concern. 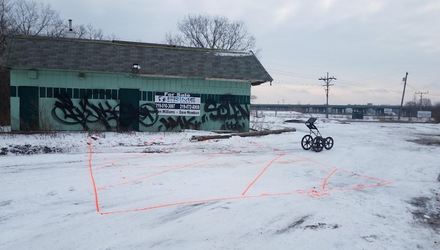 GPRS was able to provide a GPS report overlaid on Google Earth and an overlay on a pre-existing CAD file for the future building plans at this site. GPRS was contacted by a engineering firm to investigate for any buried structures or possible underground storage tanks (USTs). After arriving on site, the firm let GPRS know that there had been a truck stop with diesel filling stations at one point dating back all the way to the late 40’s or early 50’s. 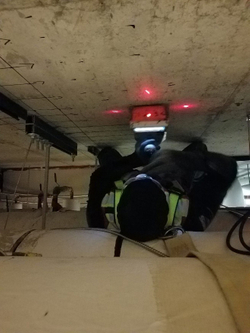 There was no clear documentation stating whether the USTs had been removed or abandoned in place, so GPRS did what we do best; create a strategy to provide the best subsurface scanning solution. GPRS scanned the area with Electromagnetic Induction (EMI) equipment, and we were able to provide conductivity maps that represented the data collected from the scanning process and overlaid on to Google Earth. GPRS also provided a detailed report which included maps of any utilities around the area as well as where the suspect tanks were to be. Data screenshots were saved for the reporting as well. The Chicagoland area is filled every year for the summer festivals, food, music, and fun. With so much entertainment available, it is commonplace to see contractors setting up structures and other festival related items, seemingly daily. The skilled contractors whom perform these tasks can make it seem like an easy and often occurring task. But it is worth noting, that these professionals would likely spend time preparing and planning in order to perform these setups safely and efficiently. There is a lot happening in Tampa right now, and we have recently expanded our North Florida team to stay ahead of the demand. We believe that scheduling GPR should be simple. You should trust the team you call. You should know that they have your best interest in mind. Scheduling an appointment should be quick, and you shouldn’t have to wait a week to receive service. Every project manager should arrive on time and be friendly, qualified, and dedicated to your project. He should make clear markings, explain what they mean, and his results should be industry leading in their accuracy. We believe that our Tampa customers deserve our above and beyond, standard. Everything we do is a reflection of these beliefs. Ground Penetrating Radar Systems, LLC. of Denver, Colorado was contacted by a casino to locate post tension cables as well as conduit within a concrete slab. The client was looking to determine where the best places to core new holes for a planned renovation including new plumbing and electrical would be. GPRS, LLC. arrived on site without delay using digital concrete imaging utilizing ground penetrating radar to map out the contents of the slab to determine how to best design the upcoming renovation. Ground Penetrating Radar Systems, LLC. specializes in ground penetrating radar service and is our primary source of revenue. With that in mind, the amount of experience and specialization of subsurface imaging and investigations as well as a nationwide network of project managers; GPRS, LLC. is unrivaled in the Ground Penetrating Radar industry. GPRS, LLC. can supply your project with the safest and most accurate ground penetrating radar service in the business. 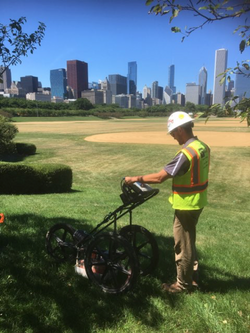 Your safety and job efficiency is our main goal at Ground Penetrating Radar Systems, LLC. Ground Penetrating Radar Systems, LLC. 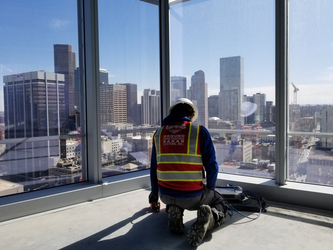 of Denver, CO was contacted by a contractor to locate reinforcement within a concrete slab. The client was looking to drill into the concrete slab to install new dowels for a planned block wall. The customer was looking to drill holes through the concrete slab and did not wish to strike any reinforcement in the process. 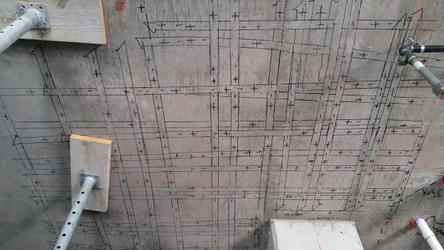 For a project like this, GPRS is able to determine several key factors of the concrete slab such as: reinforcement spacing, reinforcement depth, and slab depth of the concrete. GPRS, LLC. arrived on site without delay using digital concrete imaging utilizing ground penetrating radar to map out the contents of the slab to determine how to best proceed with this part of their project. 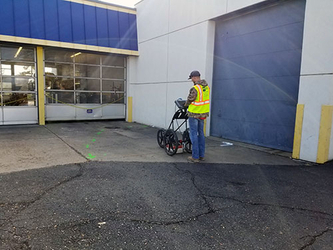 Ground Penetrating Radar Systems of Denver, CO was contacted by a contractor to locate reinforcement within a concrete slab. 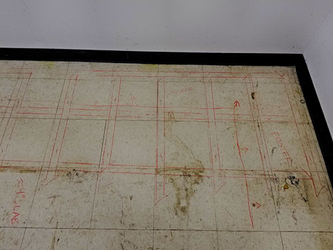 The client was looking to determine how much weight the concrete slab could hold for the installation of heavy equipment on the unknown concrete slab. 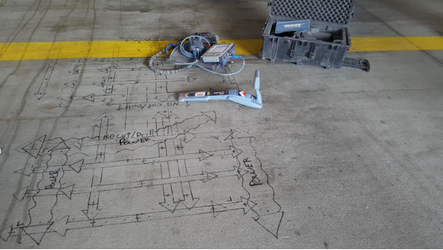 The customer was also then looking to install anchors to secure the equipment to the concrete slab and did not wish to strike any reinforcement in the process. 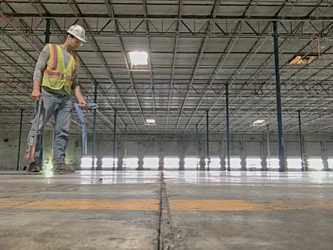 For a project like this, GPRS is able to determine several key factors of the concrete slab such as: reinforcement spacing, reinforcement depth, slab depth, approximate reinforcement size, and the existence of grade beams and/or footers in the concrete. 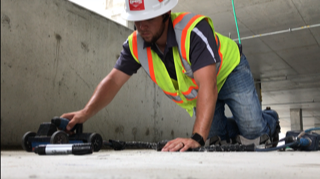 GPRS arrived on site without delay using digital concrete imaging utilizing ground penetrating radar to map out the contents of the slab to determine how to best proceed with the installation of the equipment. 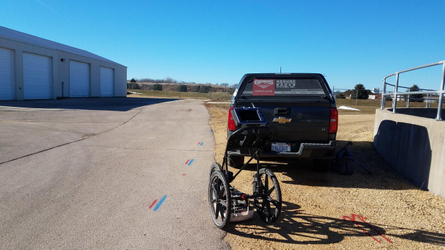 Ground Penetrating Radar Systems of Denver, CO was contacted by a contractor to locate known and unknown utilities prior excavating for structural footers at a car dealership in Golden, CO. The customer was looking to excavate and avoid striking any known and unknown lines while digging. 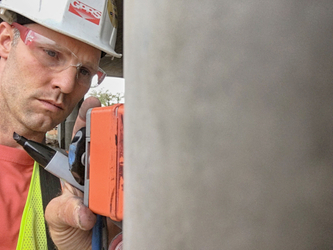 GPRS arrived on site without delay using standard locating techniques as well as utilizing GPR for a more thorough sweep of the entire area, limiting any surprises of costly repairs and/or safety concerns. 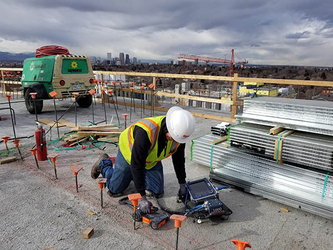 Ground Penetrating Radar Systems of Denver, CO was contacted by a contractor to locate anomalies prior to boring for soil samples at an apartment complex in Denver, CO. The customer was looking to bore in several locations. The customer was looking to avoid striking any unknown anomalies. GPRS, LLC. 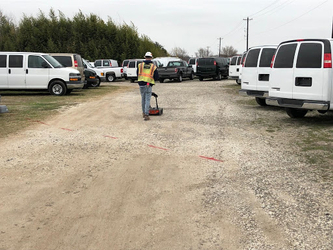 arrived on site without delay utilizing GPR for a more thorough sweep of the entire area, limiting any surprises of costly repairs and/or safety concerns. Ground Penetrating Radar Systems, LLC. was contacted by a large contractor in the bay area that needed to know the location of utilities prior to excavation. The customer’s primary concern was to identify any utilities and other subsurface items within the excavation area prior to digging, so that they could take appropriate measures to avoid costly and hazardous utility strikes. 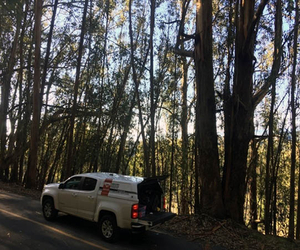 The project consisted of scanning a large section of a road within the park to prepare for excavation and road repairs. GPRS LLC. 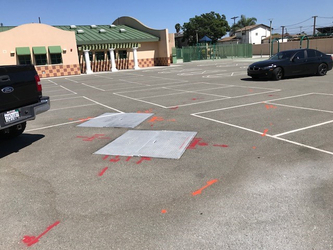 of San Diego was contacted by a local general contractor to scan for known and unknown utilities prior to installing new footings for the car ports, and boring for a new power run from the panels to the school building. This contractor was installing a new solar car port structure at an elementary school. Ground Penetrating Radar Systems, LLC. 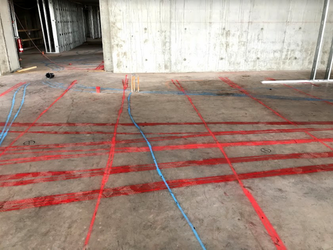 – GPRS of Arizona was contacted by a national contractor to locate all post tension cable, rebar, and conduit lines in concrete on a multi-level parking garage, in downtown Phoenix, AZ. The local contractor was responsible for installing a newly upgraded roll-up security door which was to be anchored into the existing flooring and ceiling. Timeliness of the project relied completely upon GPRS to respond and produce findings of anomalies within concrete in a quick manner so as to facility a quick install of the new door without compromising on security.